We are the major Manufacturer, Exporter and Supplier of wide range of End Shear Cutter in India as well as global market. Designed to perfection, our End Shear Cutters are made using materials like AISI-D2, D3 and H-13 and can be customized as per the clients' requirements. These End Shear Cutters are known for continuous operation and are thus, are highly demanded in various industries. 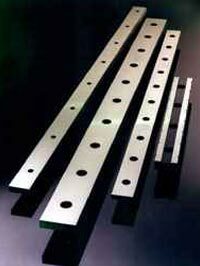 Further, these End Shear Cutters are available in varied sizes and are offered at reasonable prices.